The most successful producer in rap…is duller than Perry Como? Hip-hop journalist Ro (Raising Hell, 2005, etc.) recounts the storied career of Andre “Dr. 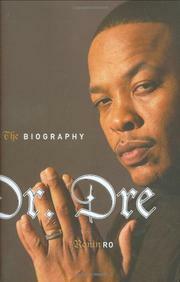 Dre” Young, arguably the most significant producer in the history of rap music. His accomplishments are legion: As a co-founder of the controversial group N.W.A., he helped establish the genre of “gangsta” rap, which focused on violent, reportorial tales of street life, in stark contrast to much of rap music’s historically light-hearted, party music approach. As a producer, he pioneered a sonically rich palette of layered drum machines, synthesizers, samples and live instruments that came to be known as “G-funk,” a highly commercial sound that defined the West Coast hip-hop approach. As a solo artist, he released The Chronic, one of rap’s defining albums. As an entrepreneur, he co-founded Aftermath Records, and he has been instrumental in establishing the careers of such luminaries as Snoop Dogg, Tupac Shakur, Eminem, 50 Cent, The Game, Eve and many others. He has successful soundtracks on his resume, has directed music videos and even acted in some small film roles. It is a mystery, therefore, that in Ro’s chronicle he comes off as a singularly uninteresting person: A remote perfectionist and workhorse with little direct exposure to the “thug life” he so lucratively celebrated, Dre seems to have spent the majority of the past 20 years behind a mixing board, cranking out hits like some marijuana-driven savant. The occasional glimpses of Dre the man are unflattering; he has run into trouble for striking women, and many of his collaborators have alleged that Dre has taken more credit for his productions than he perhaps deserves. Ro’s journalistic approach is impressive in its comprehensiveness, but the endless dry descriptions of contract negotiations, petty intramural beefs and depressingly frequent violent outbursts quickly become monotonous. The lack of musical or socio-cultural analysis leaves the book an impressively researched but dryly assembled resume. No beat, and you can’t dance to it.